Food Wine Rome app, a fully functional, GPS-driven app based on the critically acclaimed, award-winning book FOOD WINE ROME, a guidebook and pocket bible to the history and culture of food and wine in Rome today. 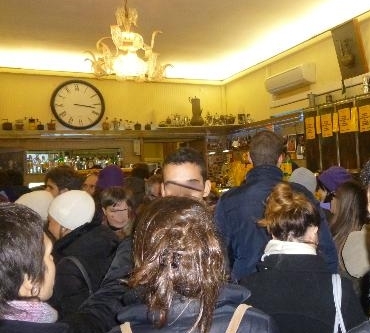 Caffè Sant’Eustachio draws devotees from around the world. Many come to drink the Gran Caffè, a double espresso with a remarkably foamy head, made according to a secret formula. Screens prevent customers from seeing Sant’Eustachio’s barmen Rome’s high priests of coffeeworking behind their machines. Brothers Raimondo and Roberto Ricci took over the historic property in 1996, improved the quality of the coffee, and left the original 1938 décor intact. Above the curving, cursive-L-shaped bar (made from a single piece of stainless steel) are vintage black-and-white photographs, hand-cranked coffee grinders, and a large wall clock. The floor has a mosaic showing the stag and crucifix of Saint Eustace, whose church is across the small, busy square. The Ricci brothers come from a family of caffè owners, are passionate, knowledgeable and, though secretive about Gran Caffè, are eager to share their passion with connoisseurs. They import the very best, most expensive Arabica beans from Africa (organic Ethiopian Sidamo) and South America (organic, fair trade Poço Fundo Brazilian, among others). The roasting is done several times a week in a small room at the back of the caffè, using a manually operated, wood-burning coffee roaster machine from the 1940s. Only a handful of experts still know how to get the hard-to-use, persnickety machine to work properly, but the results are stunning. Whereas automatic roasters operate on average temperatures and timed programs, this hand-operated machine must be adjusted and tweaked second by second. The smell of the coffee, the sound it makes, its color and shine, are what the shop’s veteran roaster goes by. Customers can watch the show from the doorway. The symphonic house blend marries beans from Brazil, Colombia, Santo Domingo, Guatemala, and Nicaragua (most of them organic and fair trade). For those who enjoy mono-varietals: of special note is the Bourbon della Galapágos, a 100-percent organic coffee from the Cobos-Gonzales plantation on San Cristòbal; the plantation’s extraordinarily long-lived Arabica plants have been producing beans since 1869. The yield is tiny, the beans small, with amazingly complex, concentrated flavors. The Ricci brothers get this coffee direct from the growers. Scoop and poop: Note that coffees served at the bar come lightly sugared; ask for yours senza zucchero if you prefer it without sugar. Chocolate lovers will want to try the luscious, three-tiered Monachella: espresso, hot chocolate and whipped cream (the name means “nun with white veil”). Sant’Eustachio pastries and cornetti are delicious. Though world-renowned, and frequented by many tourists, the caffè is unapologetically Roman and chaotic, with clients perpetually packed several deep at the bar and a line waiting for the few outdoor tables. Don’t be surprised if you see Italian senators and political potentates who drift over from Palazzo Madama, the senate building, kitty-corner. Diplomats from nearby embassies, chauffeurs and bodyguards in dark suits and darker glasses, French priests and nuns from the church of San Francesco dei Francesi, and an international mix of travelers add to the atmosphere. Also sold are a potent coffee liqueur made with the house blend of coffee; irresistible coffee-filled chocolates; chocolate-covered coffee beans and other candies; and vacuum-packed cans of ground Sant’Eustachio coffee. Don’t miss it. Tip: head to the cash desk first and get a receipt for your order before lining up at the bar.